Portrait of the Queercore movement that started when a couple of friends on the outs with both the queer community and the punk communities in Toronto decided to make films and zines that pretended that the city was the center of a gay punk scene. Little did they know that the would be taken seriously and end up starting a revolution that changed the world. As someone says if you can't find a place to belong go out and make one- which is what happened and now many of us are living there. The promotional material for the film says that queercore altered the punk and gay scenes, but that isn't right. 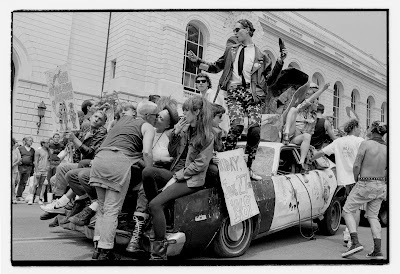 Queercore changed the world since what happened there bled out into the mainstream, and thus affected everything. If you really look at history the little pretend movement's little nudge changed the course of rivers and mountains. It also saved the lives of countless kids who found a place to belong and thrive because suddenly people realized that they weren't alone. This is a loving gritty documentary about something I suspect most music/social historians know little or nothing about. This is not orthodox history made by the kings but the story of reality told by those who lived it. Its is a film that throws a light on something that for too long has been hidden from view and not made known to the world at large. As I said above it literally changed the world. This is not just a gay or queer story but a story that has larger implications. Made with the same brash can do attitude of the old school zines the film is clearly made with a love and understanding. Its a cinematic experience that has a glorious tactile quality to it that puts the viewer back into the days when being gay and punk got you nowhere. You are in the places and the heads of those who lived the story and we are better for it. We feel what it is to be an outsider and we feel the warmth of finding a home. Perhaps best of all the film is wall to wall music and odds are you're going to want to do like me and go out and try to update my record collection. This is a great film and one of the best music documentaries of 2017. Its a must see.